Continuity mistake: During the chase scene, there is a Citroen XM series II (the citroen sign in the middle, on the front) and then there's a Citroen XM series I (the citroen sign on the driver's side, on the front). It changes back and forth a couple of times. There's also a difference at the bottom of the car; the series I carries the name Citroen XM on the left side, while the series II bears a Citroen sign on the left side and the XM sign on the right. Continuity mistake: During the big car chase the Audi S8 rams the Citroen, pushing back the headlights on the Audi but on the subsequent scenes in the town the front of the Audi is intact. Continuity mistake: When Gregor tries to sell the case, he puts the Jeep into park (we hear the sounds of an automatic transmission, and in a brief shot of the pedals there's no clutch). But he jolts the car forward a minute later without shifting into drive. 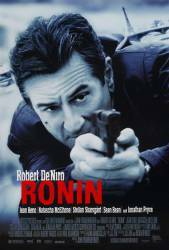 Continuity mistake: At the end of the Paris car chase with the BMW M5 and the Peugeot, Jonathan Pryce fires a few shots at De Niro and Jean Reno in the pursuit car. 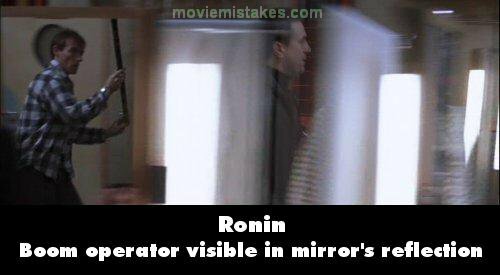 One shot takes the left wing mirror clean off, and De Niro even jerks his head to the side in reaction to the shot. The mirror comes off in mid frame, and you can even see the adjustment wires dangling from the mirror base. In all subsequent scenes, the mirror is back on the car. Visible crew/equipment: During the initial chase with the Audi S8 immediately after the messed-up arms deal, you can see exhaust fumes and tire smoke from the leading camera car in most front shots of the gang. Continuity mistake: In the early scene of the arms deal, when they are waiting in the car for the arms dealers to turn up, Robert De Niro (in the back seat) is initially unshaven, but then later in the scene he is clean-shaven. Continuity mistake: In the car chase after the bald guy with the suitcase, when his car approaches a fish market inside Nice, you can see a guy with a water hose running to the right, to avoid being hit by a car. His hose is connected to some point on the left, however in the following shot there is no pipe across the road. Factual error: In the scene where Sam & Deidre are sitting in the Audi spying on the villa, you can see that the car steering wheel is a 3 spoked sports type which is right for that model. Later just before Larry smashes it into the Citroen outside the cafe, there is a close up of him as he comes out of a side street, you can see that the steering wheel is changed to that of 4 spoke design used on the normal A8 and not on the S8. Continuity mistake: After the first big chase scene, Robert De Niro is seen with the group in their hideout. As he treats the man who was injured, he puts the bottle of alcohol down twice. Continuity mistake: In the apartment with Diedre, Seamus's hand jumps from the bottle of scotch to his side. Continuity mistake: When Gregor is in the chase scene at the old stadium, he runs/falls down some stone steps and loses his wire-rimmed glasses. In the next scene, he is wearing them once again, looking over his shoulder for Sam, who is chasing him. Other mistake: When the arms deal goes wrong by the river in Paris, Larry drives the Audi flat out straight into the tunnel where the bad guys BMW is parked right in the middle, leaving little space to get another car through. Even if he could squeeze the Audi past the other car, there were dead bodies either side that he would have to drive over, as well as crashing into the doors that were left open. This would have done some damage to the Audi at the speed he was going. Revealing mistake: In the rink, only a few shots after Natasha Kirilova is introduced, the camera pans across the crowd where Sam and Vincent are sitting and you can see that the upper half of the crowd are all cardboard cutout people. Sergi: Where do I know you from? In many of the stunt car scenes you can see the actors apparently driving. The producers used British RHD cars and fitted phoney steering wheels on the passenger sides to make it look as if the stars were really driving.